Friday instead of busing and walking to summer camp, we traveled via plane to visit with relatives—a family member had passed. It was really nice to get to visit with family even though it was sad that one of us wasn’t there anymore. Along the way we also got in a little camping, and ONE CREATOR OF ALL ROBOTS and I both saw our first flash-flood. Sunday, on our way back home, ROBOT 33 reappeared at the airport. More words were bandied about regarding spaceships, teleporters, and the kind of metal used to make robots. As we boarded, we had a few more robot discussions, with proportionately more sidelong glances. During these chats, I finally got to meet ROBOT 32 who wore her jacket around her neck rather than on top of her head. 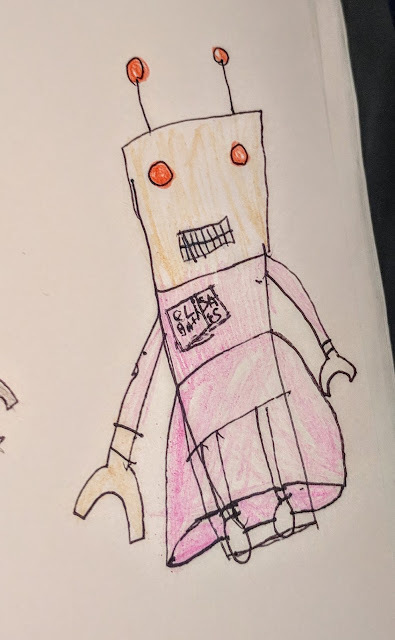 (All robots on ROBOT WORLD look just like ONE CREATOR OF ALL ROBOTS you see). Once we got on board, ONE went straight for her sketchbook. I shouldn’t have been too surprised when a few minutes later, ROBOT 33 appeared on the page. A few more minutes, and I knew exactly what ROBOT 32 looked like. 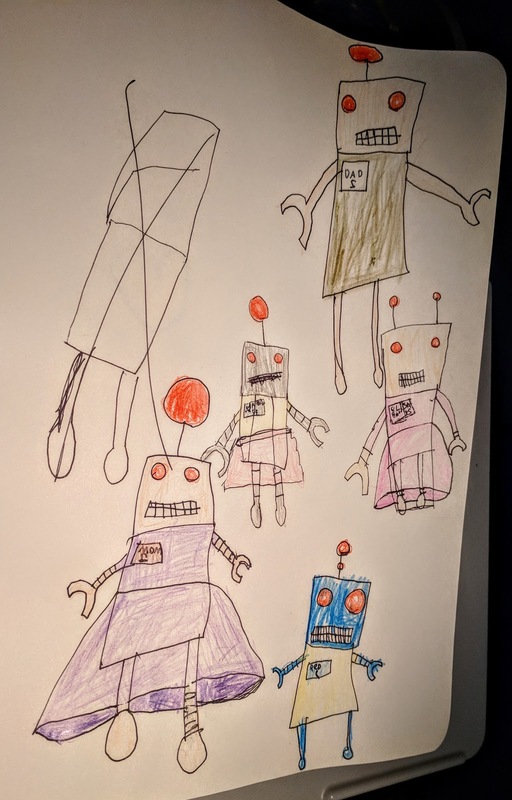 Awhile later, an entire family of robots inhabited the page. I giggled; they were the best robots I’d ever seen, happy even though they were gritting their teeth, and with dazzlingly colorful clothes. Art draws One’s active focus like almost nothing else, (pun kinda intended). I love that she’s completely in the zone when she’s creating. It doesn’t matter what’s going on around her, or where she is—I don’t think she noticed the plane taking off. As an unschooling dad who’s also trying to be a respectful parenting kind of person, it’s incredible what I get to see when I keep my mouth shut. 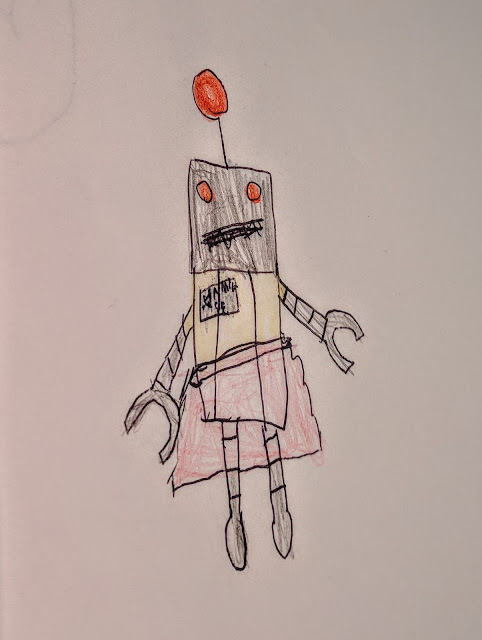 I noticed, ROBOT 33 had her legs outside her skirt. I didn’t make a peep, and right before my eyes, One developed her artistic abilities all by herself; ROBOT 32’s legs were colored so that they wound up inside her skirt! I love that One’s found a passion, she enjoys just for the act of doing it. She frequently sketches several times a day. Her written stories are always illustrated. Her To-Do lists are always illustrated! It makes me happy that she can take the time—although not much of it since most of her creations emerge from the page on buses, trains, and plains—to integrate her passion into her everyday life. Unschooling rocks in that every kid gets to define and pursue their own passions. Two’s passion might be fashion, but aside from making a nice rhyme, that’s a story for another day.